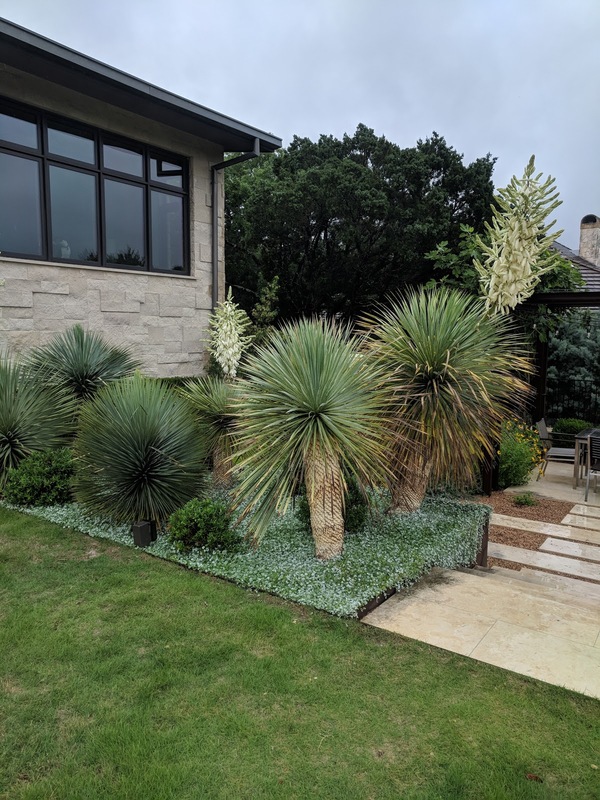 Oddly, one thing i really noticed during the Austin Fling is probably "Garden Design 101". But somehow, the ability of humble mulch, applied consistently, to make the garden look even better, really struck me during all the garden tours. 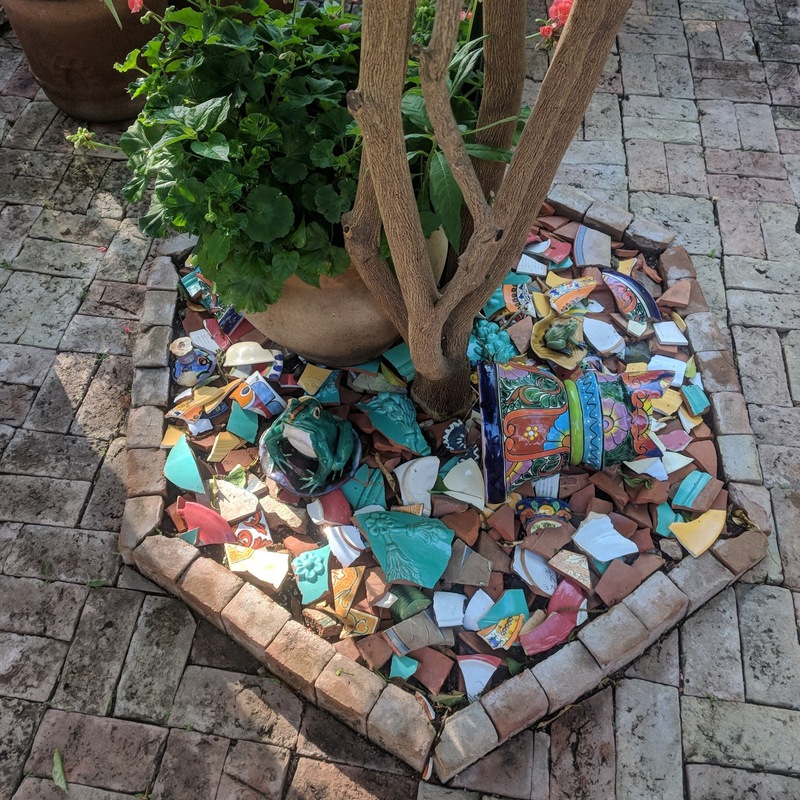 this was in the front garden - so neat! 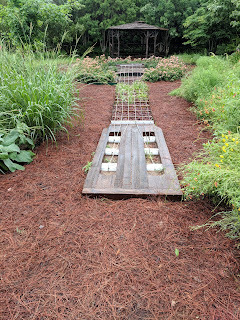 At the Natural Gardener, it was pine needles that were mulching the guitar garden. So clean! and fun to walk on! Mirador was a poster child for consistent gravel mulch - so gorgeous! even in the less formal parts of the garden, the same gravel was used. 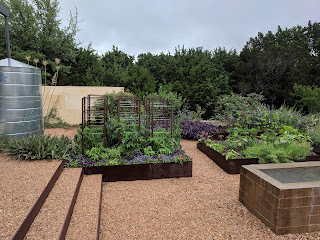 In Pam Penick's garden, the look was a bit more loose, but still orderly, and a clean background to all her beautiful plants. I may have poked in a few places to see how deep the gravel was as well. she also used consistent ground covers as mulch in some of her beds. I imagine this combination below looks really amazing in the summer. At B. Jane's garden, the mulch went a step further and was the same in both the planting beds and the containers. I'm not sure i want the same mulch in the beds as the hardscape (that would be DG). 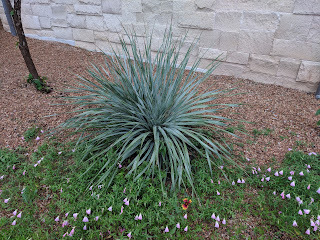 But certainly consistent cedar mulch is something i can do in the not-cacti beds. For the cacti/succulent/agave areas, rocks would be better. I'm not sure i can approach Mirador levels of consistency there. I like the more natural, desert-y look of different sizes of gravel. For the gravel paths, or large expanses of the dry stream & pond look, I can be a bit more consistent. And use a deeper layer. I could use the same DG as my outdoor container mulch - that would make a lot of sense. 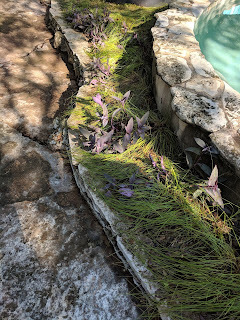 If i can get some of the ground covers from the back garden to grow in other areas, that might help with consistency as well. I'm definitely not this neat either! I've never ordered a truck load of mulch... but that might be one way to get consistency! I wouldn't know where to store left overs though? I am a big fan of mulch, for the very reason you mention...it really cleans up the garden and sets off the plants. Obviously (at least I think it is) for the front garden that means gravel, in most of the back garden it’s a thick layer of compost every spring after I’m done working in the new plants. Not only is it good for the soil, but it hides the pumice from digging and planting nursery grown plants. 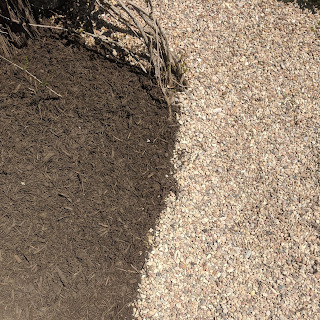 I HATE seeing the white pumice against brown soil, it looks like dandruff. Oh and I must have pea gravel mulch in my containers too. 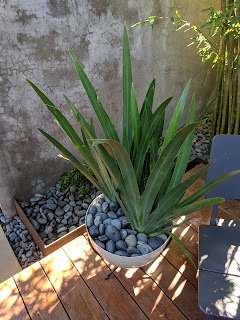 Hides the ugly soil (again with the pumice, and sometimes fertilizer granules) and kept the soil from splashing around when I hit it with a stream from the hose. Glad to know I'm not the only one who hates pumice. Nurseries act like I'm deranged when I tell them I don't buy anything that contains it, not even putting soil. 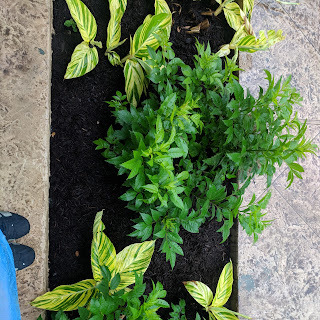 I'm chuckling because I debated adding fresh wood mulch to all my beds (it's a tour-prepping trick that works wonders) but cheaped out and only added new mulch where it had grown thin. 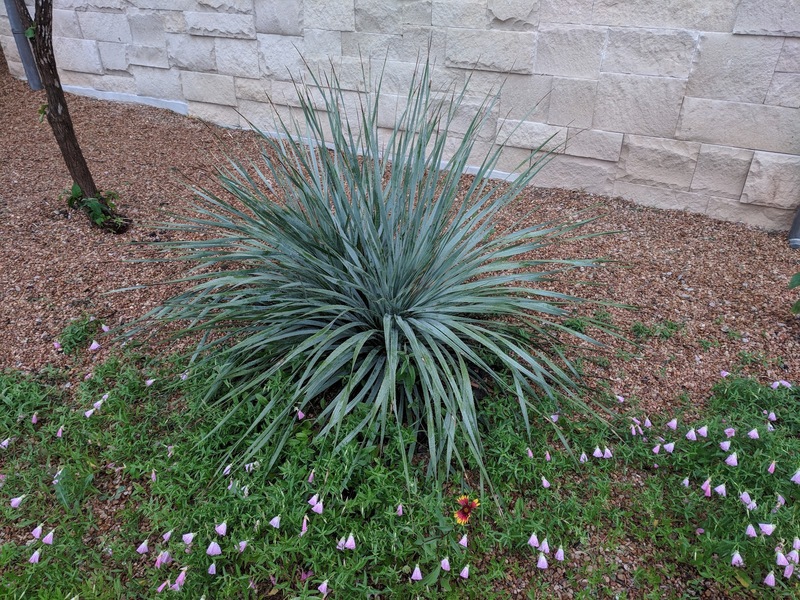 Austin gardeners DO use mulch religiously to help preserve moisture in the soil, especially useful during our broiling summers. It's better to use rock mulch for desert-style gardens, not only because it looks more natural but because it helps drain water away from the roots rather than holding it there. Austin is blessed with an abundance of quarries, so it's easy to get crushed gravel and decomposed granite to pave our paths and mulch our dry-garden beds. Mexican beach pebbles (like in B. Jane's garden) are also popular here, but imported and expensive -- and possibly not as sustainable. 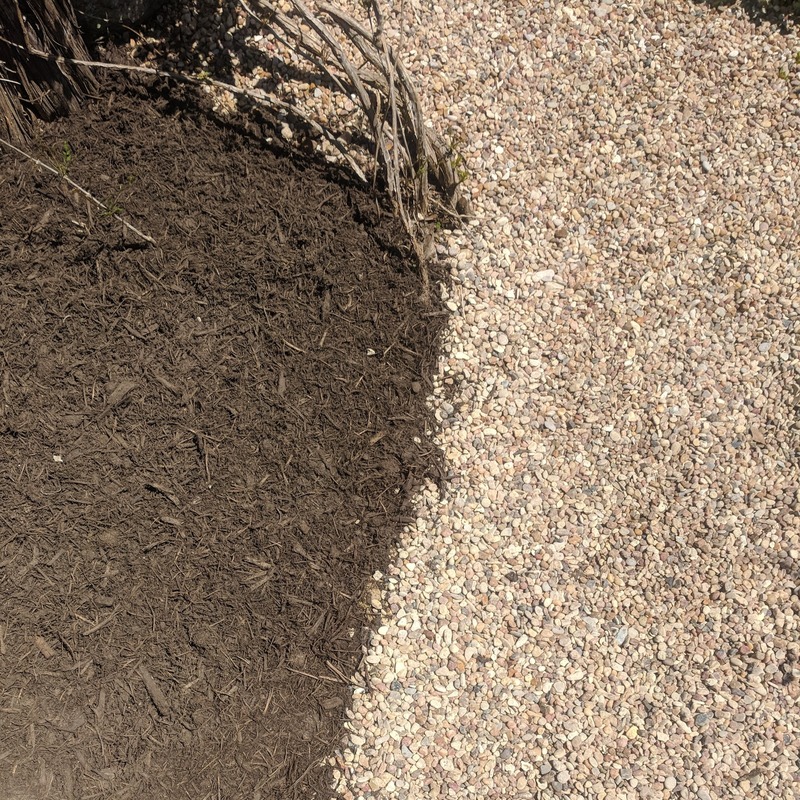 I really like the look of two different sizes of the same gravel for mulching beds and delineating paths, which might be a good solution for your garden? We can get DG and other local rock fairly well and in a sustainable manner, although matching colors, especially for the DG is always an adventure. I've actually come around to wood mulch in the deeper planting beds - i'm not too worried about it holding water in the summer since, well, we have no water... And certainly I didn't notice any lacking mulch in your garden! 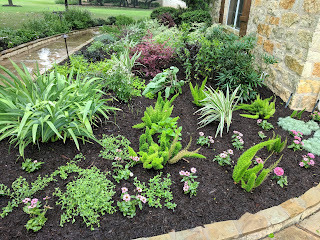 I admired the different types of mulch used in the Austin fling. It's a part of my gardening game that I need to improve! I use a lot of aged leaf litter from my trees to mulch the back garden, tho I've decided to gravel the succulent portion of the back garden. The front garden is a mish-mash of gravel and small rocks, all of which has integrated into the soil, so it's probably destined to forever grow succulents now. I'm told to avoid landscape cloth, which would keep the gravel and soil separate -- I've got many mulch questions too! I've given up on landscape cloth in all areas expect under pea gravel for paths. And i can't wait until my trees are big enough to mulch things other than themselves... although pine needles make the soil more acidic, i think? So many questions! An interesting mulch survey. Well done! 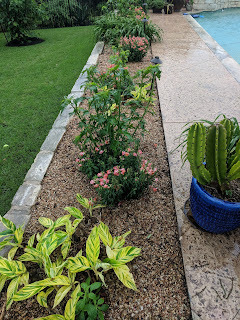 Another pro mulch gardener here, though spreading 8 or 9 cubic feet of it is extreme physical effort on a multi-slope 1/2 acre, not to mention quite a bit of $$$. 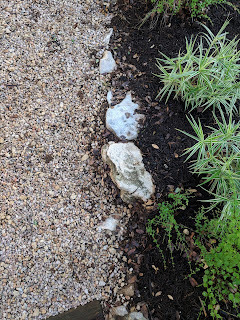 yes - gravel does get hot, which is partially why i like to for paths more than mulch (i pretend it cooks the weeds...) Do you mulch the whole garden at once? Then i assume you get it delivered by truck?